This is my Media Technology graduation project (MSc, Leiden University), supervised by Maarten Lamers. It started with a personal observation: playing with a pet can be more surprising in the long-run than playing a computer game. But is it possible to merge the unpredictable behaviour of an animal with a computer game by replacing parts of the computer code with animal behaviour? And how will it affect the game? 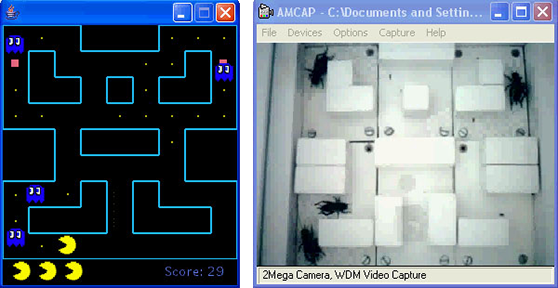 To study these questions, we created a variant of the Pac-Man computer game in which the virtual ghost characters are controlled by real crickets that run around in a real maze. In nature, vibration of the ground warns crickets for an approaching predator. We chose to use this behaviour to stimulate the crickets in the game. 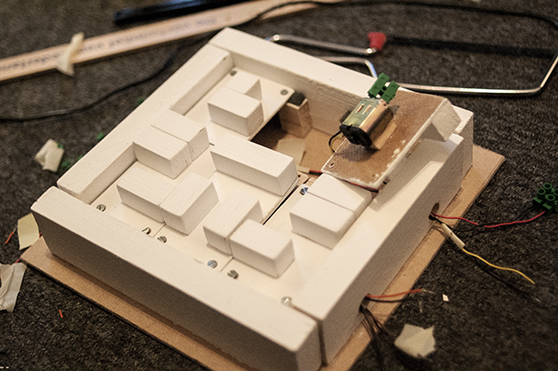 We divided the floor of the maze into six parts, each with a motor attached underneath that vibrates when switched on. When the crickets should chase Pac-Man, we switch on the motors furthest away from his location in the maze, so the crickets will flee in his direction. When Pac-Man eats a power-up, the crickets are supposed to run away from him, so we then vibrate the part of the floor that contains Pac-Man’s position. When we started to play our game the crickets reacted to the vibrations as they should: they followed or fled from the player accordingly to the game state. 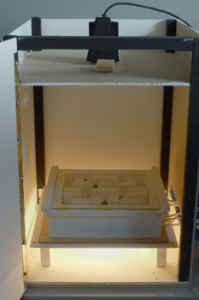 But surprisingly the crickets quickly got used to the vibrations, they habituated. After a couple of minutes they hardly reacted to them anymore, they seemed to have learned that the vibrations do not pose a threat. Only after making the vibrations much stronger they reacted on them for a longer time. After about half an hour they started ignoring the vibrations again recurrently. Example of gameplay footage. The 4 pink lines indicate which part of the maze is currently vibrating. During our tests something else happened which was very intriguing. One of the crickets stopped moving at all, and on closer inspection we discovered it was shedding its skin. The cricket’s new skin was very light, and therefore it did not get detected by our colour tracking anymore. We now had a cricket which could freely walk around in our maze, not getting detected by our system, which was still tracking its old skin. After about half an hour the cricket’s skin turned dark enough to also be noticed by the colour tracking, resulting in five ghosts being put in the game. At this moment our game really surprised us, you could say the crickets generated an extra piece of code to the game. This kind of unexpected behaviour was exactly what we were hoping to encounter during this research.We conclude that animal behavior can effectively create surprising situations within computer games that stretch beyond pre-programmed game situations. This research has been presented at the 5th International Conference on Entertainment Computing (ICEC2006) on 20-22 September 2006 in Cambridge (United Kingdom) and received worldwide attention. More information about the article can be found here.